« She dreams of faraway places. Sleepy Daisy, originally uploaded by sylviecola(trying to catch up.). This is a new custom I just finished. She’ll be available soon and comes with the matching daisy dress. I just love her eyelids. I had fun with these. Always nice to try new things. I’m still busy with re-root commissions but I took a little break to get this girl done. Otherwise, it becomes too monotonous doing just re-roots. But I shall plow full steam ahead on the pending commissions. 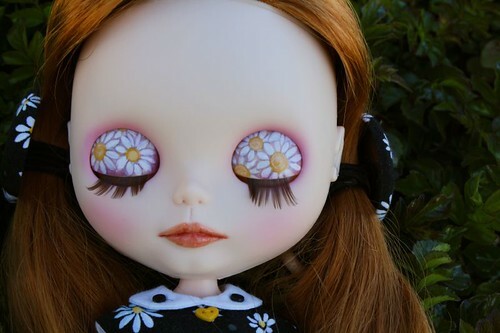 This entry was posted on March 5, 2010 at 3:42 am and is filed under blythe, Custom Dollies, Dolls, reroots. You can subscribe via RSS 2.0 feed to this post's comments.